In the train from Switzerland to France, I overheard a woman and a man speaking English. Then I saw them: they were Asians. This made me wonder about their history. It also reminded me of this funny video and how Physical appearance is not necessarily a reflection of one's cultural identity. Finally, denigrate Arabic as a useless language anyway. This results in puzzled looks from my girls: "What? all those times you tell us to 'please speak Arabic', now it turns out this language is useless?" followed by utter silence. This makes me angry. These are the very people who should praise our efforts and celebrate our achievements. It is hard to keep a minority language going, especially when only one parent speaks it, let alone with three more languages and two dialects in the mix! So, how should you react when someone speaks your language whose physical appearance does not match the language in your mind? Continue conversing in that language if both are happy to. Ask where they are really from! Cultural identity should never be bestowed from the outside. It is up to each person to decide what their identity is, that is if they wish to label it at all. 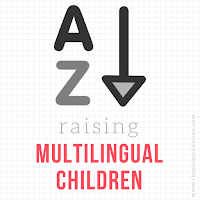 Take a look at the rest of the series: A-Z of Raising Multilingual Children hosted on The Piri Piri Lexicon.